Did the Exodus of Moses and His People Happen? In the Bible, he is called Moses. In the Koran, he is the prophet Musa. Religious scholars have long questioned whether of the story of a prophet leading God's chosen people in a great exodus out of Egypt and the freedom it brought them afterwards was real, but the similarities between a pharaoh's ancient hymn and a psalm of David might hold the link to his existence. Christian scripture says Moses was content to grow old with his family in the vast deserted wilderness of Midian, and 40 years passed until the Bible says God spoke to him through the Burning Bush and told him to lead his people, the Israelites, out of Egypt. According to tradition, that miraculous bush can still be seen today enclosed within the ancient walls of St. Catherine's Monastery, located not far from Moses' hometown. But there was another figure in the ancient world who gave up everything to answer the call from what he believed was the one and only true God. 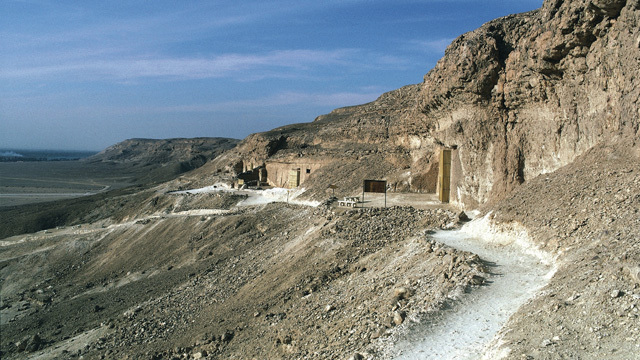 Archaeologists discovered the remains of the ancient city of Amarna in the 1800s. Egyptologist Rawya Ismail, who has been studying the ruins for years, believes, as other archaeologists do, that Pharaoh Akhenaten built the city as a tribute to Aten, the sun. She said it was a bold and unusual step for the pharaoh to leave the luxurious trappings of palace life in Luxor for the inhospitable landscape of Amarna, but it might have been his only choice as the priests from the existing religious establishment gained power. "The very powerful Amun-Ra priests that he couldn't stand against gained control of the whole country," Ismail said. "The idea was to find a place that had never been used by any other gods -- to be virgin is what he called it -- so he chose this place." All over the walls inside the city's beautiful tombs are examples of Akhanaten's radical message of monotheism. There is the Hymn to the Aten, which translates, in part, to: "The earth comes into being by your hand, as you made it. When you dawn, they live. When you set, they die. You yourself are lifetime, one lives by you." Some attribute the writing of the hymn to Akhanaten himself, but it bears a striking resemblance to a passage that can be found in the Hebrew Bible: Psalm 104. "If you compare the hymns from A to Z, you'll find mirror images to it in many of the holy books," Ismail said. "And if you compare certain parts of it, you'll find it almost exactly -- a typical translation for some of the [psalms] of David." Psalm 104, written a few hundred years later, references a Lord that ruled over Israel and a passage compares him to the sun. "You hide your face, they are troubled," part of it reads. "You take away your breath, they die, And return to dust. You send forth your breath, they are created, And you renew the face of the earth." Like the psalm, the Hymn to Aten extols the virtues of the one true God. "A lot of people think that [the Hymn to Aten] was the source of the [psalms] of David," Ismail said. "Putting Egypt on the trade route, a lot of people traveled from Egypt and came back to Egypt, it wasn't like a country living in isolation." Ismail believes it is possible that the message from the heretic pharaoh has some connection to the story of Moses and the Exodus, as outlined in the Hebrew Bible. "That helps us reference Moses' existence as it was the same message that he was calling for, which may have been before Akhehaten had got infected with it," she said. The Bible says that after Moses accepted his dangerous mission to get the Israelites out of Egypt, he confronted the pharaoh. The pharaoh refused to let his people go until God unleashed a series of unnatural disasters known as the 10 plagues. Jews commemorate this event and the Exodus on Passover. "The evening before the 10th plague, Moses instructed the Jews to sacrifice a lamb and to paint its blood on their doors so that the angel of death would know who was Jewish and who wasn't. This is where the term 'Passover' comes from," said Jonathan Safran Foer, the author of "New American Haggadah." The Bible says the angel of death swept through Egypt, including the palace. When the pharaoh's son died, he sent for Moses and told him to take his people and go. But then, the pharaoh realized he was losing a huge work force, so he called up his army and chased the Israelites to the Red Sea. As the story goes, Moses called upon the power of God to part the Red Sea and the Israelites walked into the Sinai Desert to freedom. Religious historians estimate the Israelite population in Egypt at the time was around two or three million people, but the biblical Exodus route into the Sinai Desert has left no trace other than what the Bible tells us. "There is virtually no evidence, as the Torah says, that 600,000 Jewish males, with their wives and children and elders, left Egypt in the Exodus," said Rabbi Burt Visotzky, a professor of Talmud and Rabbinics at the Jewish Theological Seminary in New York. "Those are big numbers. You'd think someone would notice." In the Hebrew Bible, the body of water is called Yom Suf, which translates to Sea of Reeds, leading some scholars to suggest that the story is talking about a swamp instead of a huge body of water. "When it comes to Moses, again, you have a really larger-than-life portrait," said William Dever, a professor of archaeology from Lycoming College. "I doubt that the miracles attributed to him ever took place. I don't think he led three million Israelites out of Egypt in an exodus across the Sinai. I don't think he was the founder of Israelite religion, but I think there was a Moses. I argue, and I think some other archaeologists will, too, there was a small exodus group -- not millions of people, but perhaps a few thousand -- who did escape from slavery in Egypt." When a Jewish child turns 13 years old and prepares for his or her bar or bat mitzvah, they study the story of the Exodus and sing the ancient song of freedom. In the Jewish tradition, it is the same song that was supposedly sung by Moses' people when they made it out of Egypt, making the story of Exodus timeless and never-ending. "What we say at the end of Seder is 'next year in Jerusalem,' but it's kind of funny to say that now because we could go to Israel," Foer said. "Jerusalem is more than a place. Jerusalem is an idea. Jerusalem is an ideal place where there are no slaves, where we don't have to continue on this perpetual march towards freedom because everybody has freedom." Did Moses' Exodus Really Happen?